“What kind of backup camera should I buy?” “Which backup camera do I need?” Over the past 10 years, I have been asked that same questions thousands of times, and my answer usually starts with; How many cameras do you envision having in your rear view system? This tells me what type of backup camera kit the customer wants, and we custom build a system from there. How to find the best backup camera for your vehicle? If you have an RV, Trailer, Camper, 5th Wheel or any other large or commercial vehicle and you’re looking for an economical solution, then you would probably only want 1 backup camera. 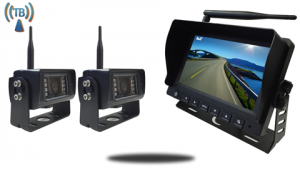 In that case, I would go with a 7-Inch Monitor with Wireless Mounted RV Backup Camera (SKU90117), that kit is recommended because it includes everything you need for installation. It comes with a bird’s eye view backup camera that you can mount on the back of your RV, on the roof or even over your license plate. Most rear view backup cameras today come with a 120-degree viewable angle, it is the minimum you should have and if the option to upgrade to 170 degrees is available we suggest you take it. This will allow you to see approximately 3 lanes behind you. Another feature you will commonly find today is night vision, a lot of companies claim to have night vision but it isn’t always accurate, make sure that you see “Military-grade night vision” in the specs, this will ensure that the LEDs that you see on the camera, soak in the light, in contrast to the fake night vision that project light backward and thus only giving you a short 5-8ft range view but also creating the dangerous situation of blinding the vehicle or person behind you. True night vision will show you at a minimum of 30ft behind you in pitch dark and those behind you wouldn’t even know it is active. 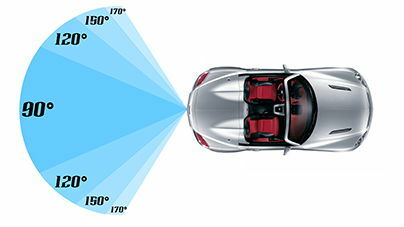 As for the rear view monitor, most people today purchase at least a 7-inch screen. In the past, 7-inch and up were thought to be huge but over the last few years these monitors have been slimmed down and they have thinner bezels so they take up significantly less space. A good quality rear view monitor has 2 main features, the first is that they should look good in daylight and second in that they should all have at least 1 additional input, which would allow you to connect a second backup camera in the future. If you don’t see it in the specs it’s easy to see by looking at the pictures on the face of the rearview monitor, if you see something similar to AV1/AV2 or Cam1/Cam2 then you have found it. The second question I usually get is “Is it hard to install, can I do it myself?” to that I can tell you that with all my years of experience most people can install the backup camera kit by themselves, the technology is not difficult, when you purchase a wireless backup camera kit the concept is that you first connect the backup camera to the 12 volts and then the rear view monitor to the 12 volts and when you power up the system it should all work. 95% of the time that is how everything works out, on the few occasions that it doesn’t; a 5-10-minute tech support question should solve it. When deciding what rear view camera system you want to go with, I always say the same thing, ask yourself how many cameras and what size screen you want? then make sure they have a lenient 30 day money back/exchange policy because you might want to change or upgrade your system, once you see how everything works. Finally, when deciding between a $200 system and $400 I can tell you this, Your RV was expensive and you don’t splurge like this every day, buy what you really want, even if it’s a little more than your planned budget, after all like most things in life, you get what you pay for. If you own a car and you want to purchase a backup camera for it this guide: How to Choose The Right License Plate Backup Camera? will help you to understand more about the difference between our license plate backup camera systems which are the most command backup systems for cars. Example for some of our reliable and affordable backup camera kits. Am considering the SKU 90113 kit. My main hangup deals with the 12V connection for the camera. This will be a travel trailer (pull type) setup. Suggestions on how and where to make this connection would be welcome. Thanks.